The most obvious distinctions between mammals and reptiles are the fact that mammals have hair or fur, and mammary glands which they use to nourish their young. These features do not fossilize, and no known mammals have left hair or fur impressions in the rock surrounding their fossils. Fortunately, however, there are also a number of skeletal differences between reptiles and mammals. For one, reptiles have a mouth filled with several teeth which are more or less uniform in size and shape; they vary slightly in size, but they all have the same basic cone-shaped form. By contrast, mammals tend to have teeth which vary greatly in size and shape; everything from flat, multi-cusped molar teeth to the sharp cone-shaped canines. In reptiles, the lower jaw is comprised of several different bones, which hinge on the quadrate bone of the skull and the angular bone of the jaw. In mammals, however, the lower jaw is comprised of only one bone - the dentary, which hinges at the quadrate of the skull. In mammals, there are three bones in the middle ear, the malleus, incus and stapes (also known as the hammer, anvil and stirrup). In reptiles, there is only one bone - the stapes. The reptilian skull is attached to the spine by a single point of contact, the occipital condyle. In mammals, the occipital condyle is "double-faced". The classic reptilian skull also has a small hole, or "third eye" through which the pineal body extends - a trait not found in any known mammal. "In many respect[s], the tritylodont skull was very mammalian in its features. Certainly, because of the advanced nature of the zygomatic arches, the secondary palate and the specialized teeth, these animals had feeding habits that were close to those of some mammals . . . . Yet, in spite of these advances, the tritylodonts still retained the reptilian joint between the quadrate bone of the skull and the articular bone of the lower jaw. It is true that these bones were very much reduced, so that the squamosal bone of the skull and the dentary bone of the lower jaw (the two bones involved in the mammalian jaw articulation) were on the point of touching each other." 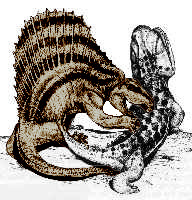 "The two most distinguishable osteological differences between reptiles and mammals, however, have never been bridged by a transitional series. All mammals, living or fossil, have a single bone, the dentary, on each side of the lower jaw, and all mammals, living or fossil, have three auditory ossicles or ear bones, the malleus, incus and stapes. In some fossil reptiles the number and size of the lower jaw bones are reduced compared to living reptiles. Every reptile, living or fossil, however, has at least four bones in the lower jaw and only one auditory ossicle, the stapes. . . There are no transitional fossil forms showing, for instance, three or two jawbones, or two ear bones. No one has explained yet, for that matter, how the transitional form would have managed to chew while his jaw was being unhinged and rearticulated, or how he would hear while dragging two of his jaw bones up into his ear." "The reptiles, as we have noted, have one bone in the middle ear and several bones in the lower jaw, and mammals have three bones in the middle ear and only one bone in the lower jaw. On the other hand, the jaw joints in the reptile are formed from different bones than they are in the mammalian skull. Thus, it is apparent that, during the evolutionary transition from reptile to mammal, the jaw joints must have shifted from one bone to another, freeing up the rest of these bones to form the auditory ossicles in the mammalian middle ear. (In fact, in most modern reptiles, the jawbones in question actually function in transmitting sound waves to the inner ear, so the transformation postulated above is not a functional change, merely an improvement in a f[u]nction that these bones already had). As Arthur N. Strahler puts it, "A transitional form must have had two joints in operation simultaneously (as in the modern rattlesnake), and this phase was followed by a fusion of the lower joint." (Strahler 1987, p. 414) ... Not only is this explanation not 'merely wishful conjecture', but it can be clearly seen in a remarkable series of fossils from the Triassic therapsids. The earliest therapsids show the typical reptilian type of jaw joint, with the articular bone in the jaw firmly attached to the quadrate bone in the skull. In later fossils from the same group, however, the quadrate-articular bones have become smaller, and the dentary and squamosal bones have become larger and moved closer together. This trend reaches its apex in a group of therapsids known as cynodonts, of which the genus Probainognathus is a representative. Probainognathus possessed characteristics of both reptile and mammal, and this transitional aspect was shown most clearly by the fact that it had TWO jaw joints--one reptilian, one mammalian." Next in the reptile-to-mammal transitional sequence are the cynodonts. Pictured here is Cynognathus, a classic example of the cynodont reptiles. Of course, when faced with a specimen such as this, one is forced to wonder if it can truly be called a "reptile". The skull appears basically mammalian, the hip structure seems basically mammalian as well, but with very distinct similarities to reptiles as well. Also notice that the grastral ribs and vertebrae seem to be forming a primitive breast-bone (sternum) - and strikingly resembles the gastral ribs/vertebrae of the earliest mammals from several orders. The gastral "floating" ribs have been reduced to almost nothing, and they are completely absent in mammals, yet very large in reptiles. This animal isn't quite a mammal, but it isn't quite a reptile either. This animal truly appears to be ½ reptile and ½ mammal. It is a perfectly intermediate form. (2) Synapsid, Therapsid - "Reptile"? Shortly after the time of the Cynodonts, we find a gap in the mid-late triassic (239-208 million years ago). Until recently, there were no known therapsid fossils occupying this area of geological time. However, Adelobasileus cromptoni, a fairly "new" species, has been discovered; its age is 225, putting it squarely in the middle of the triassic gap. Though only a skull was found, "[s]ome cranial features of Adelobasileus, such as the incipient promontorium housing the cochlea, represent an intermediate stage of the character transformation from non-mammalian cynodonts to [Tr]iassic mammals". The proto-mammal Adelobasileus is thought to be either (1) the common ancestor of all mammals, or (2) a very close relative of that common ancestor [Hunt, 1997]. The next proto-mammal (Sinoconodon) appears 208 million years ago. Its cheek-teeth are now permanent, as in modern mammals, however the other teeth are still replaced several times (as in reptiles). The mammalian-joint of the jaw is "stronger, with large dentary condyle fitting into a distinct fossa on the squamosal...[t]his final refinement of the joint automatically makes this animal a true 'mammal'...[r]eptilian jaw joint still present, though tiny." [Hunt, 1997] The rear of the braincase has also expanded and the eye socket is fully mammalian. "Eozostrodon, Morganucodon, Haldanodon (early Jurassic, ~205 Ma) -- A group of early proto-mammals called "morganucodonts". The restructuring of the secondary palate and the floor of the braincase had continued, and was now very mammalian. Truly mammalian teeth: the cheek teeth were finally differentiated into simple premolars and more complex molars, and teeth were replaced only once. Triangular- cusped molars. Reversal of the previous trend toward reduced incisors, with lower incisors increasing to four. Tiny remnant of the reptilian jaw joint. Once thought to be ancestral to monotremes only, but now thought to be ancestral to all three groups of modern mammals -- monotremes, marsupials, and placentals."